tuxbox: hacking my computers: Elrond: Blu-ray, Windows Media Center, Etc. 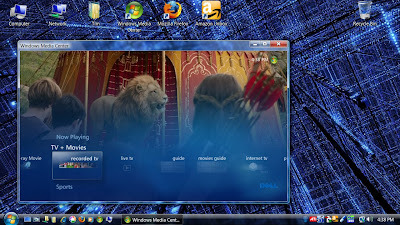 Elrond: Blu-ray, Windows Media Center, Etc. So I bought another computer: Elrond. Elrond will be the living room media PC. Elrond is a Dell Inspiron 530 with Blu-ray and an HDTV tuner. It has Windows Vista Home Premium, which comes with Windows Media Center. Media Center This is the first time I've messed with Media Center, and I'm mostly impressed. It was very easy to set up. The only really annoying thing is that if you have two tuners, they can't be hooked up to two different sources: I wanted to have the HD tuner record over-the-air broadcasts (which it can do in HD) and have a second USB tuner (that I had bought with my laptop) handle the SD signal from cable. No dice. It only supports managing one guide, and assumes that all tuners have access to it that guide and nothing else. Lame. Currently, I have it set up with just the HDTV tuner hooked up to cable. It can't record any of the cable HDTV channels, unfortunately, because it doesn't have a QAM tuner (HDTV signals are in a different format on cable than over the air). I think Athena's tuner supports QAM (and it ignores the broadcast flag too), but I haven't set up MythTV yet (which is ironic, since MythTV was one of my primary reasons behind putting Athena together in the first place). The reason I decided to go with SD cable is because it has the most content by far. If I want to record some over-the-air HDTV, I can switch it over to that temporarily. If I get MythTV running on Athena, I should be able to record anything I want. [Edit: According to the manufacturer's page, my tuner can indeed receive QAM HDTV signals, but they apparently have to be clear QAM (i.e., not encrypted or "scrambled"). My TV is able to tune to the HD stations without the cable box, which means it might be simply a matter of configuration: downloading the right listings that tell my computer it can tune to HDTV channels. Whether Comcast provides listings including HD channels is another matter.] [Edit: Apparently, it's not Comcast, it's Microsoft. Windows Media Center doesn't support QAM, unless you buy a special computer designed specifically for it. This seems stupid to me, because these channels are being sent over the wire in the clear. Back to square one. Time to get MythTV up and running.] [Edit: There appear to be ways around WMC's artificial restriction (by getting tuner hardware and drivers that lie about where the video comes from). Interesting. I'm still going to explore my MythTV solution. Currently, I have MythTV up and running, but nothing shows up on a channel scan.] Blu-ray So, I've finally bought myself a Blu-ray drive. I was hoping to wait until full-featured stand-alone players went down in price to the $200 mark. It doesn't look like this is going to happen anytime soon. Blu-ray players actually went up in price after the end of the format war with HD DVD (surprise, surprise), and they don't show any signs of going down any time soon. The best "value" on a Blu-ray player was still the PS3, and I'm not that interested in the PS3 for gaming (and I already have as many Linux boxes than I need) so that wasn't looking like a good deal either. I was looking at the Dell website for a PC for the living room, and I saw that they had a special deal on a Blu-ray player, in addition to a big chunk of money off the computer, and my employee discount program percentage off, so I bit. I was hoping that I could have the option of hooking up my HD DVD drive (Xbox 360 attachment) to the PC and have it play both, but it only came with PowerDVD DX version 7, which supports Blu-ray and not HD DVD. Not a big deal, of course, since I have a stand-alone player (HD-A3). The only problem I ran into as far as Blu-ray playback is concerned is that I wanted to output Surround Sound to my receiver digitally. For this, I had to buy a sound card, and since the two digital optical input ports were already occupied (by the HD DVD player and the TV), I needed a coaxial digital S/PDIF out. I found one at Fry's (Diamond XtremeSound 7.1 for $30 with a $10 rebate), hooked it up, and told Windows to use that card's digital out. In order to get it to output Dolby Digital 5.1 during movie playback, I had to configure the settings of the PowerDVD program to output to "SPDIF"; before that, it was still sending stereo.